The Roll of Honour was the first War Memorial for the whole of Penarth, for men of all faiths and none. It is a work of art in the Arts and Crafts style. The overall design and painting of the heraldry, regimental insignia and other decoration was the work of John Dickson Batten (1860-1932) while his wife Mary Emmeline Batten (1873-1952) was responsible for gilding (but not the memorial record). Joseph Armitage (1880-1945) carved the main portion of the canopy. He is probably best known for his design of the oak leaf emblem for the National Trust. The rest of the memorial (but not the text of names) was carved by William Wheeler (1895-1984) although his linen-fold panelling was later covered up for the names of the World War II casualties to be added. The names were cut by William Barnes and gilded by Joseph Hewlett and the two lines of dedicatory inscription were cut by Mrs Stanton, ARCA. 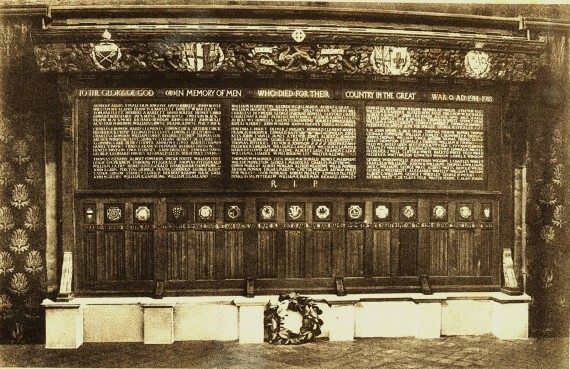 The Roll of Honour was dedicated in 1920. The Roll of Honour team is trying to find out how much the Roll cost and how it was funded. A recent search in the Glamorgan Archives has revealed that the estimated cost was £800 – equivalent to at least £25,000 today – and the money was raised by public subscription. Considering that in many households money must have been very short, to raise anything like that amount was a tremendous achievement.